It was midway through my dessert when I realized that I might have made a mistake. A soft and pliable custard topped with honey was resting on a base that seemed far too wheat-like for my stomach’s tastes, a deliciously dense and textured bottom layer that had absorbed the sticky honey and become soft and pliable. I had shown the restaurant’s owner my gluten free travel card and had explained that ingestion of any wheat would make me sick. I also quietly threw in that it would mean a few days of joint pain and other fun problems. He assured me that the dessert had no wheat or flour in it at all, that it was full of honey and dairy products and “beyond delicious.” On the latter front, I completely agreed. On the former, not so much — that night was one where I communed heavily with the toilet in my tiny bedroom. So much for gluten free Greece. Since the restaurant was near where I was staying, I returned the next day to ask about ingredients. He listed them off, wheat-free. I asked what the base of the dessert was made of. Sheepish recognition slowly dawned on his face. Already know you want a gluten free restaurant card? 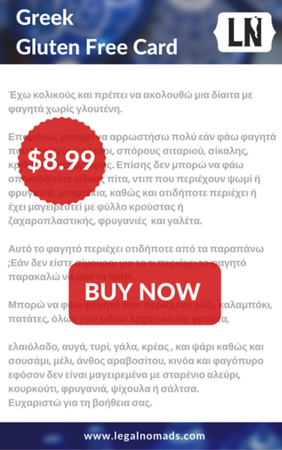 You can buy my Greek card here, as well as Italy, Japan, Spain, and more! 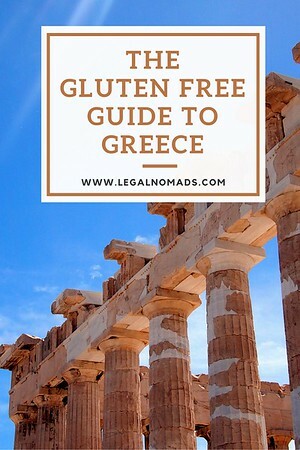 What is Safe and Gluten Free in Greece? 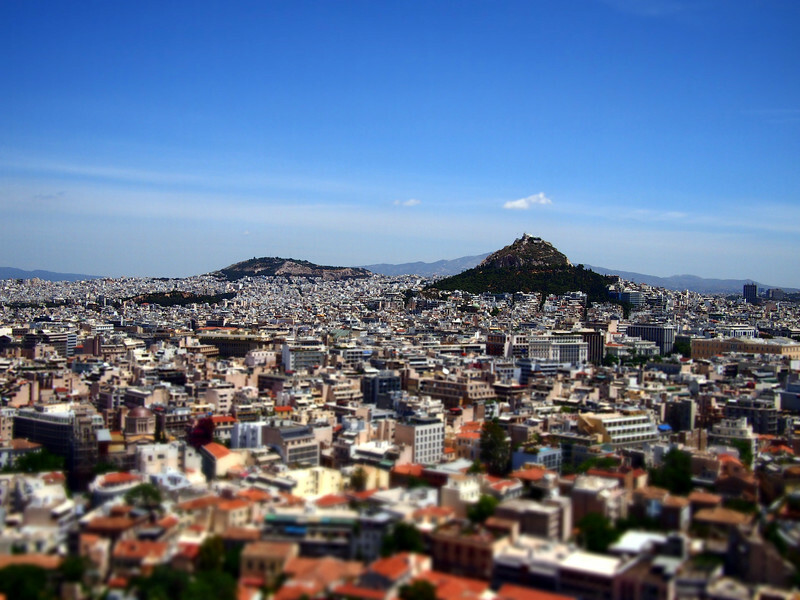 What is Unsafe for a Celiac in Greece? For celiacs, eating out can be incredibly stressful. It’s not merely a strong stomach ache, or a dash to the toilet. It’s that for many of us, the next morning you find that you cannot bend your joints in your hands, or you are lethargic and weary for days. There are varying levels of people affected by the disease, but I realize when travelling to foreign places that my stomach’s restrictions are an imposition on cultures that are not as sensitive to allergies or auto-immune diseases as my own. That said, despite being a relatively new phenomenon in Greek society, Greek restaurants were extremely helpful. Like Italy, Greece loves its food, and wants people to enjoy the act of eating. The possibility of not participating in a full and satisfying meal gave many a heart-clutching heart palpitation, and more than one place was excited to learn that I enjoyed a modified meal made by them. In the case of my Greek dessert, this was not the chef or owner’s fault. Yes, I was sick because of a mistranslation, but there was no point in getting upset at him as he was merely trying to help and to ensure I tried all of the foods that I could in his beloved city. I did explain that pastry dough was made with wheat flour, in the event another celiac came through. But more importantly, I wanted to provide a better gluten-free card, with specific translations and a longer list of items that we, as celiacs, could eat. When I visited the newly-opened Museum of Gastronomy in Athens, co-founder Konstantinos Matsourdelis made an interesting point about the financial crisis in Greece forcing the country refocus their diet inwards, with the government offering incentives to local farmers to grow crops. Instead of relying primarily on imports, Konstantinos said the devastating crisis had a silver lining: it reconnected the country to its agricultural roots, with new products based on these subsidies now hitting the market. Hopefully this focus also extends in part to those with food restrictions. To build this detailed card, I availed myself of a contact with Helen from Discover Greece, a private sector-led tourism organisation. She happily connected me with several people who made the rest of my Athens trip wheat-free, including the lovely Despina from Culinary Backstreets. Despina was kind enough to not only sit down and talk about my attempts to eat gluten-free in Greece, but also offered to have me test out an Athens food tour tailored to celiacs, which included buckwheat bread (see below for bakery info), perfect for mopping up fava and feta. I have used several different translation cards on my travels, and still got sick. I may be more sensitive than some celiacs, but even a small amount of contaminated oil for frying, or a small bit of wheat in the food, is enough to make me ill for days. Let alone the joint pain later that week! extremely detailed, including local dish names and ingredients — so others can hopefully avoid their own Great Pastry Dough Mishap. The card includes items like pastry dough or thickened meatballs or bread crumbs, but also makes it clear that we can eat buckwheat, yoghurt, rice, and more. It has been translated by a local who is very familiar with the food industry and celiac disease. During my food walk, Despina chatted about the influence of both Asia Minor and Turkey on the current state of Greek food, reaching back into her own family’s history and further still to Greek mythology. From the basic staples in Greece – olive oil, pulses, wine, grains — to newer starches like potatoes, which were introduced by the government in the 1830s, she gave a great overview of diet in different parts of Greece. “Food is a form of joy and love,” she said. I can’t disagree. For the most part, the following suggestions include restaurants that are not specifically gluten-free, but rather include menus or dishes that are safe to try. As a result, I thought it would be helpful to include things that are not safe to try, because this country likes to use bread crumbs and/or flour to thicken unexpected things. Like parsley dip. Also, note that fries are usually fried in separate oil, meaning that they are uncontaminated and delicious. Celiacs, be warned: if you love fries as much as I do, you might need to factor in some workouts to your visit to Greece. I asked at every place I went to that served French fries, and each one was appalled that I would even suggest they fry their fries with other food — it was all safe to eat, but do please keep asking just in case! 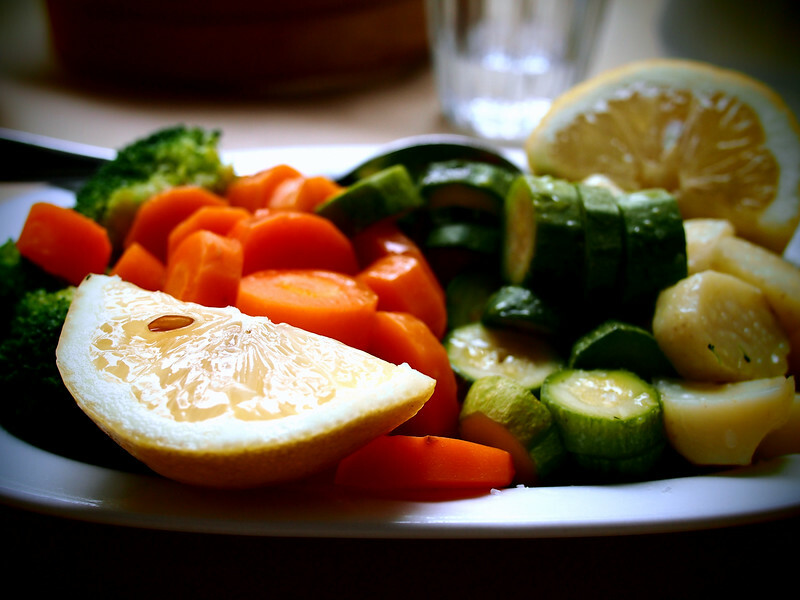 Even when not on the menu, most restaurants will have a simple dish of steamed vegetables served with lemon. In the event you cannot find a side dish that works for your stomach, the chef will almost always oblige. Type of vegetables will vary wildly depending on the season. Something tells me I might put on some weight here in Greece. Food much more dense than in Vietnam. Delicious, but so heavy — even the dips and meze. Have taken to sharing portions with friends but this plate is the HALF portion of gyro! Surprisingly robust meal sizes here. LUNCH BREAK. A deserved meal after all those stairs. Slow roasted lamb, potatoes, no gravy, just the meat’s own juice. Delicious and simple, cooked in the oven. Wander around near a subway station or market and you will inevitably find (and smell) a rotisserie or souvlaki joint offering gyros, or grilled chicken, or the classic souvlaki. The platters of meat or chicken are often the most expensive as they are still served with bread, but with double the portions of meat. I found that asking for a regular gyro but without the bread resulted in confusion but also exactly what I needed — a small portion of meat with some vegetables. I ordered the platter when I was sharing with friends. Please do show your celiac card at the same time, as the reasons for your pickiness are medical, not finicky. It goes a long way toward getting you a plate but doing so respectfully. For those with bigger appetites, the platters will be great — just be sure to keep asking for no pita because inevitably the platter has two thick, warm slices throw atop the meat and salad when served. Where: In Athens, I enjoyed my most delicious and succulent grilled chicken at Gyro Gyro Ouli, located at 28 Sina Street. Map here. For souvlaki, I also loved the cheap food and really fun outdoor ambience at Gyristroula, located at 9 Agion Asomaton Square, corner of Adrianou street, across from the Thissio subway station. 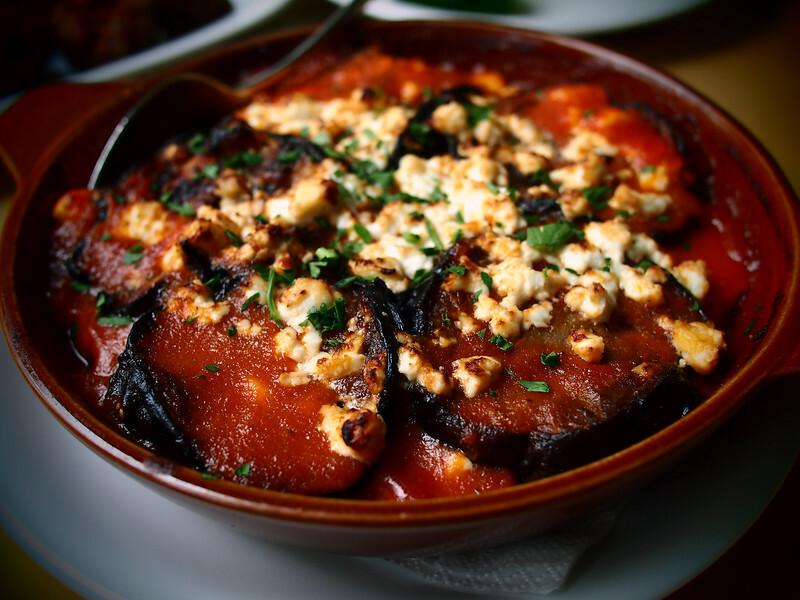 Eggplant, feta, and tomatoes – one of my favourites. Eggplant was in season during my Greece visit, and Greeks know precisely how to use it in their food. Baked with pillows of feta and chunks of lamb, or roasted like an open-faced sandwich, toppings piled high, or tucked into tomato sauce and topped with fresh herbs. You name it, and it tasted delicious. With the exception of moussaka or fried eggplant dishes, I had great success with any baked eggplant on the menu. Where: I ate the first dish pictured above at a place called Gougoumeze, conveniently located close to the gyro place above at 10 Sina Street, also in Kolonaki. 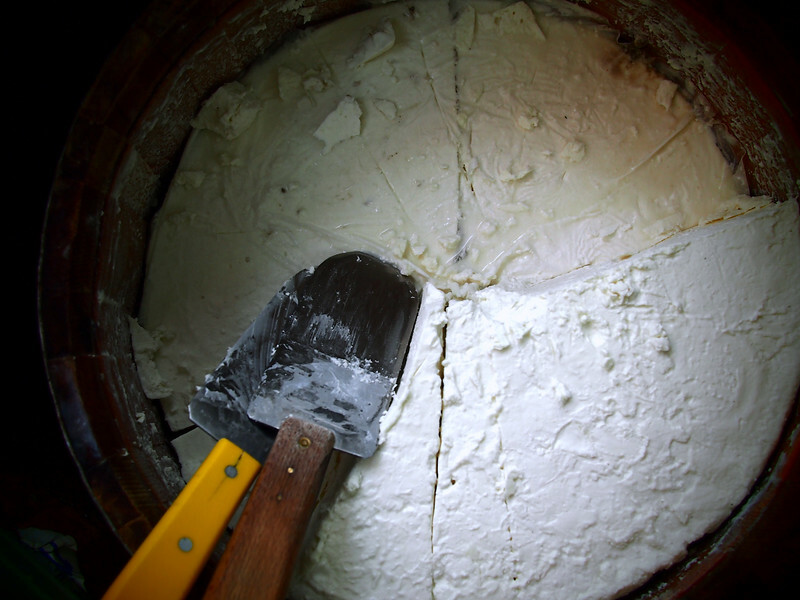 “For the Greeks, cheese is not a food supplement, it is food.” – TED Case Study on Feta. Growing up in North America, I associated feta with any white cheese that was in brick form and could be placed on a salad. This was a mistake. 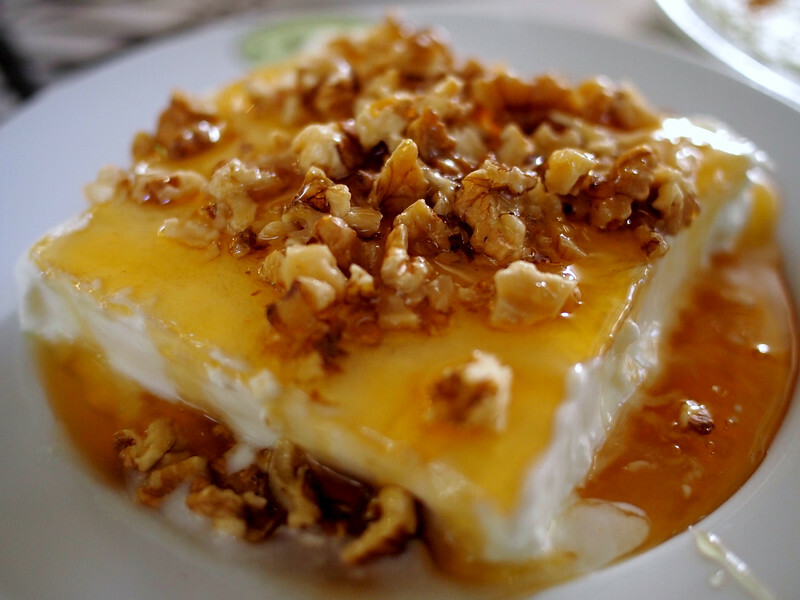 Feta is, much like other products of specific origin, the subject of considerable controversy. Cornell has a long piece on ‘the Feta wars‘, but essentially Feta was affording a status of Protected Designation of Origin (PDO), meaning that a cheese cannot be called “Feta” without it satisfying certain conditions. Namely, (a) The cheese must be produced and matured in a specific geographical region, (b) the use of chemical substances for the maturing and colouring of the cheese is prohibited, (c) the milk must not contain any antibiotics, and (d) it must be produced in the traditional manner. Since a 2005 judgement from the European Court of Justice, white soft cheeses that resemble feta but not fulfilling the requirements above must be labelled differently. In any event, the Feta I tried in Greece was like no other. Some more briny than versions I have tried in Canada, some soft, some merely crumbling under the weight of my fork. I would urge anyone travelling to Athens to go to Athens’ big central market, and try as many as you can. Freshly picked mint leaves, plump tomatoes, feta, olive oil, salt & pepper. Simple dinner, so delicious. Snack of champions. (I donated the olives to friends). Simple Greek salad, the feta topped with thyme — it grows all over the hills of Syros — and capers. Delicious. After months in Southeast Asia, I was craving salad like nobody’s business, and nothing prepared me for just how glorious these salads could be in Greece. From chunks of feta over a simple cucumber, olive oil, tomato, and onion salad (I removed the olives, of course), to tomatoes, mint, and Feta, the herbs fresh from the garden. When I did not see salad on the menu I merely asked for what was available. Without fail, I received a bowl of fresh and flavourful vegetables and fruit for the eating. For those with celiac disease, these salads are a lifesaver if you are at a quick restaurant with little non-wheat options. 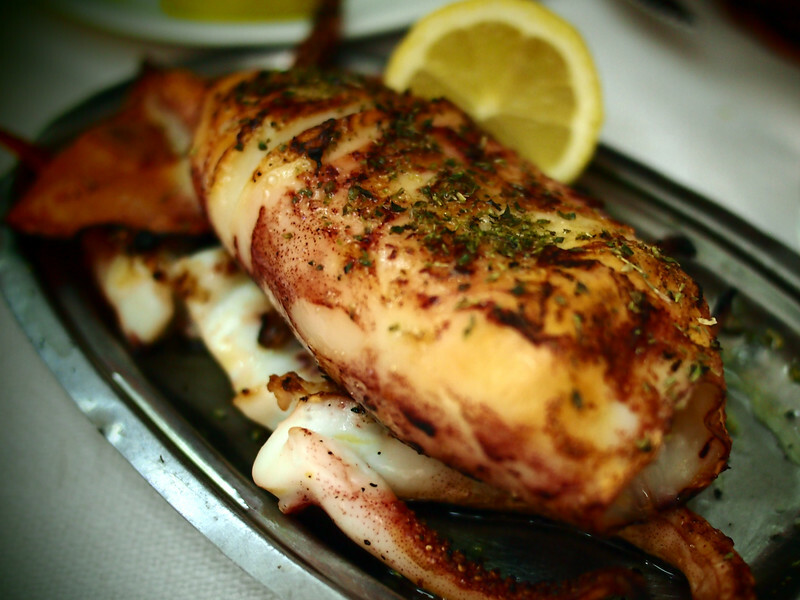 Grilled squid with lemon and herbs. SO GOOD. 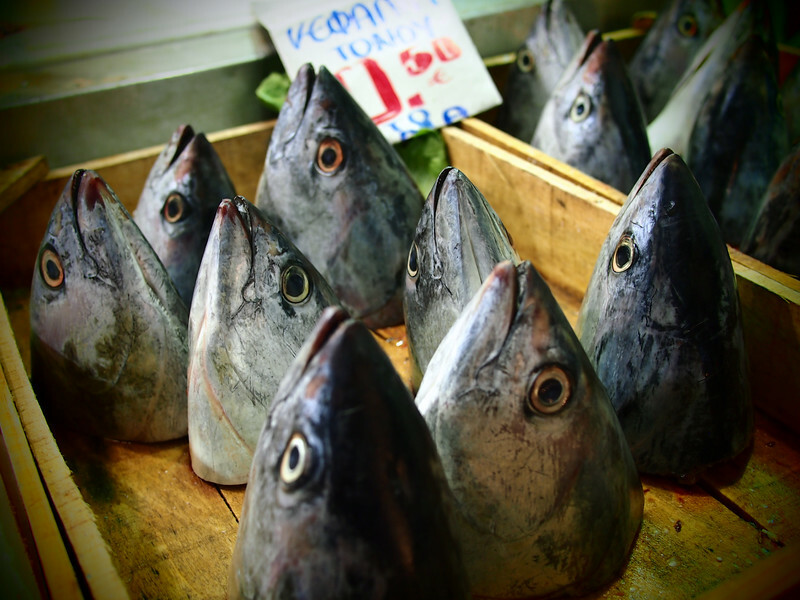 A simple safe meal, I often opted for grilled fish or meat prepared with herbs and served with a generous half or quarter of a lemon. Again, for those times where fried fish in batter was on the menu, it was an easy request after proffering my GF card to see if a special grilled version could be made on my behalf. Restaurants were happy to oblige with a batter-free protein option, and the grilling meant that I was not worried about cross-contamination with oil used for breaded dishes. Fava dip, often made with yellow split peas (λαθούρι) is a purée seasoned with onions, olive oil, and fresh parsley. It is ordered as a meze, eaten at room temperature or slightly warmed, scooped up with huge chunks of bread. I was able to pick up my own bread in Athens made from 100% buckwheat from Pnyka, thanks to Despina calling ahead to order it for me. You will see fava dip on the menu just about everywhere if visiting in the spring/summer. 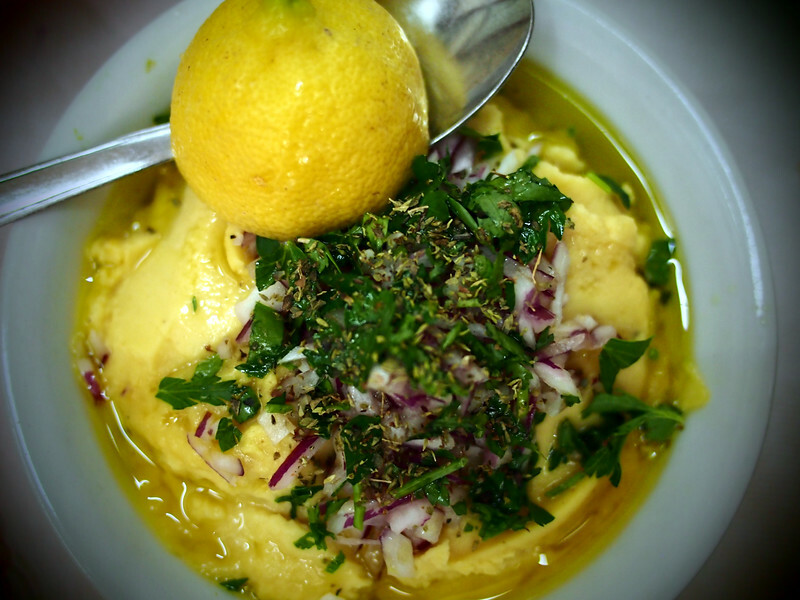 I have tried many versions of split peas, fava bean hummus, and other bean dishes but I still find myself craving the creamy yellow dip from Athens, especially soaked in fresh lemon juice. Tzatziki is a dish many of us are familiar with, a yoghurt dip with cucumber and often some fresh mint. None of the restaurants I frequented used flour in their tzatziki. 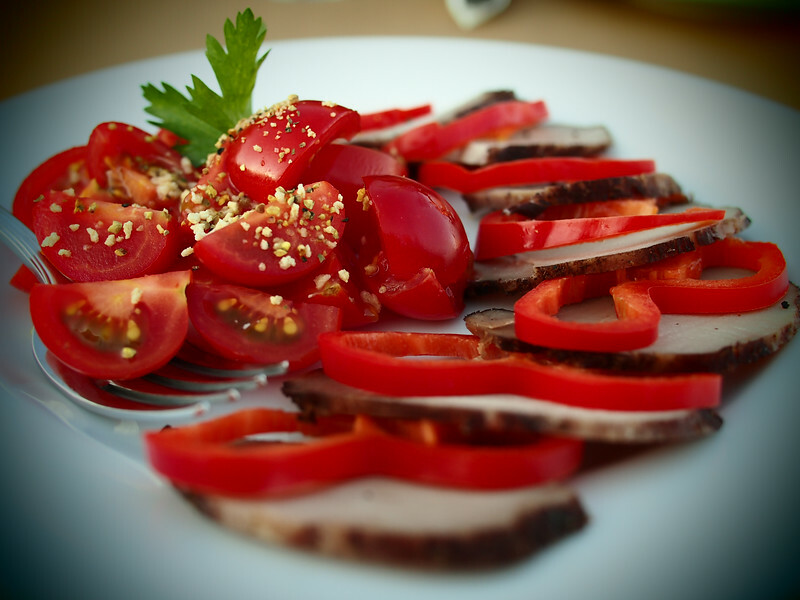 The photo below is from a more artisanal version of apaki, a Cretan smoked pork dish where the pork is sliced in strips and then marinated in vinegar and spices for days, then seasoned further and smoked under a slow heat. The point, whether it is a beautifully presented version or otherwise, is that it is delicious — and gluten-free. Even if the dessert menu tended to specialize in cakes, it was often possible to mention my disease and then receive a yoghurt and honey plate (or, if I was lucky, yoghurt and cherry compote) instead. If you want to try it in its best environment, you can eat at Stani, a dairy in downtown Athens where the house yoghurt is made out of sheep’s milk from dairy farms just outside Athens. Address and review from Culinary Backstreets here. Saganaki Cheese – named after the pan in which it is made, cheese cooked saganaki style is pan-friend and coated in flour, served piping hot. Parsley Dip (Maintonasalata – mαϊντανοσαλάτα) – this delicious parsley dip unfortunately includes bread crumbs, something I only realized late in the game. For those who are not gluten-free, a recipe is here. It’s delicious. 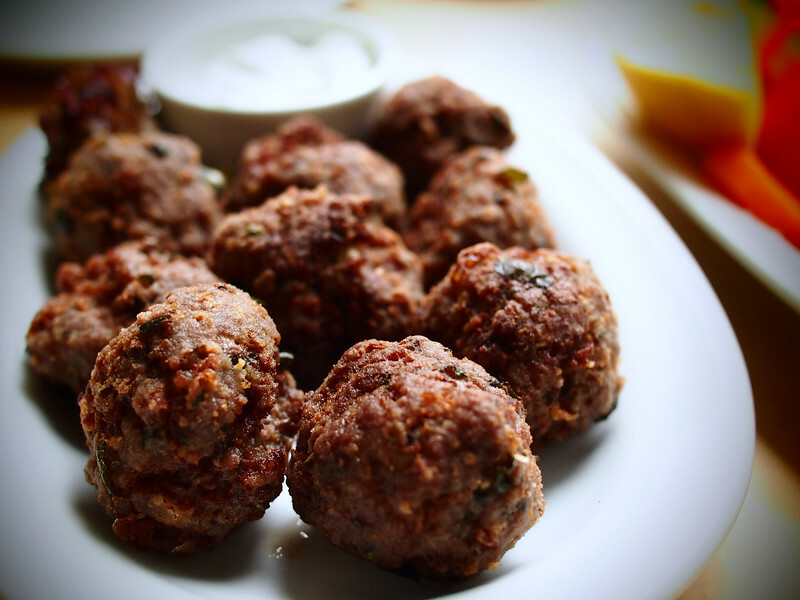 Meat Balls (Keftedes) – Perfectly fried balls of meat — and with bread crumbs included at no extra cost. Sigh. Patsitsio – a beef and pasta dish, which also has flour bechamel sauce on top. Vegetable stews – important to ask about these at restaurants, since many are thickened with flour. Spanokopita – a cheese and spinach pie. I spent most of my time in Greece on the island of Syros, and have a guide to sights and food on that island, also. For the rest of my free celiac guides, see here.